Price is for 30 cookies(10 hand decorated, 20 fresh baked). 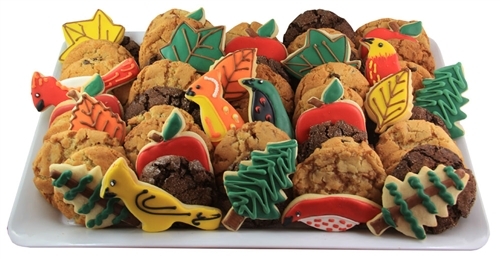 (Approx 3.5" cookies) Larger and smaller platters are available. Please call or email with your specified quantity. If you require individually packaged cookies - please click here. 30 cookies in total on a platter - 10 hand-iced cookies of your choosing with 20 fresh baked cookies (chocolate chip, spiced mayan chocolate, double chocolate, or salted caramel flavour) (Email us with your desired shape and fresh baked cookie recipe choice after check-out) Delicious, fresh, unique cookies that will wow your guests at birthdays, weddings, and promotional events. Larger and smaller platters are available. Please call or email with your specified quantity for pricing. Your cookies are presented on a platter and shrink wrapped. Larger and smaller platters are available. Please call or email with your specified quantity.